Delicate Curves Jewelry - This is an elegant sterling silver three-dimensional pendant that accents a pear shaped black onyx cabochon. This handcrafted limited edition statement necklace includes an 18" snake chain. 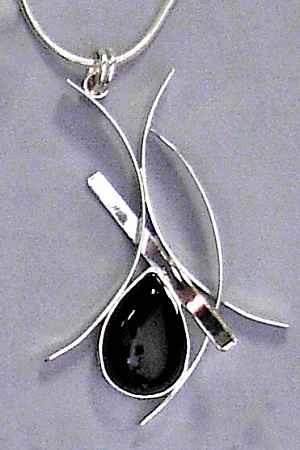 A beautiful modern sterling silver pendant with a tear drop shaped black onyx. This abstract piece hangs from a sterling silver chain and is signed and created by Aaron Rubinstein and Modern Art Jewelry.